SAN FRANCISCO (LOG NEWS SERVICE) — America’s Cup racing began off San Francisco Sept. 7, with around 80,000 spectators watching the action on shore. Emirates Team New Zealand won four of the first five races in the 34th America’s Cup finals. Defender Oracle Team USA had won one race in the first three days of the best-of-17 series. 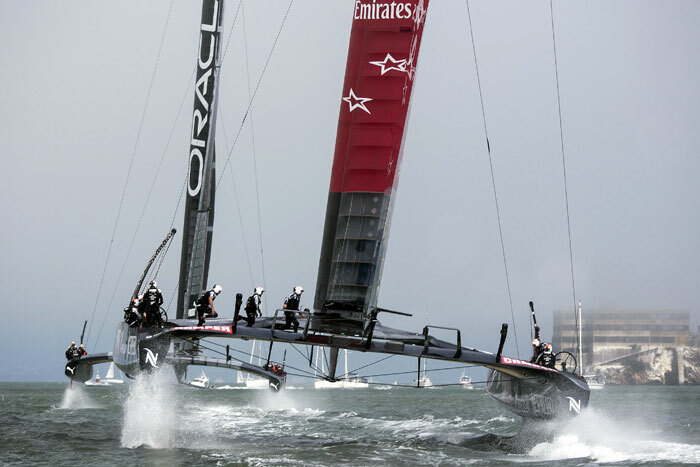 However, due to a two-race penalty imposed on the U.S. Cup defender following unauthorized additions to the team’s America’s Cup World Series boats, Oracle Team USA started the racing series with a score of minus-2 — causing the Kiwis to lead the series with a score of 4-0. Although the Kiwis were considered by many to be the underdog until Oracle Team USA was hit with the hardest penalties in the regatta’s 162-year history, New Zealand now appears to have an edge — having only to win a total of nine races while Oracle must win a total of 11 races, because of the two-race penalty. When racing resumes at 12:30 Sept. 12, Emirates Team New Zealand will need to win five more races to take the Auld Mug home to Royal New Zealand Yacht Squadron, which held it from 1995-2003. Oracle Team USA, because of the 2-point penalty, has to win 10 more races to keep the silver trophy. In the biggest cheating scandal in America’s Cup history, an international jury docked Oracle Team USA two points after finding that crewmembers illegally modified 45-foot catamarans that were used in the warm-up regattas of the America’s Cup World Series. Besides docking Oracle 2 points, wing trimmer Dirk de Ridder was booted from the regatta, along with two shore crewmembers. Grinder Matt Mitchell was banned from the first four races and the syndicate was fined $250,000. America’s Cup officials estimated that during the first two days of racing, approximately 80,000 fans watched from the America’s Cup Park, at Piers 27/29 and the America’s Cup Village at Marina Green, as the giant AC72 catamarans, with their 13-story wing sails flew along the 10-mile course. The boats were foiling at speeds in excess of 50 mph at times, officials said. Thousands more watched from other vantage points along the bay, and from aboard hundreds of boats scattered along the race course, officials said. Race dates have been scheduled through Sept. 21, if needed. Updated race results will be posted online, at thelog.com.